One for my Mum for Christmas, yes I said it, Christmas! And one for me. My Mum really liked the last one I made for her and asked for another one for Christmas. So I found the fabric I wanted, bought it, and made it. I’ve been meaning to make myself another for the last few months, so making one for my Mum spurred me on to make mine. Now I’m very aware that I’m not posting much lately, but I’m also not making as much either. Partly down to my hormones, and not being in the mood for sewing. And partly down to trying to wear what I already have. My wardrobe is pretty full of lovely things I’ve made, so I’m trying to get the wear out of them. So maybe I’m not feeling a gap in my wardrobe right now. so I don’t feel the urge to make stuff. 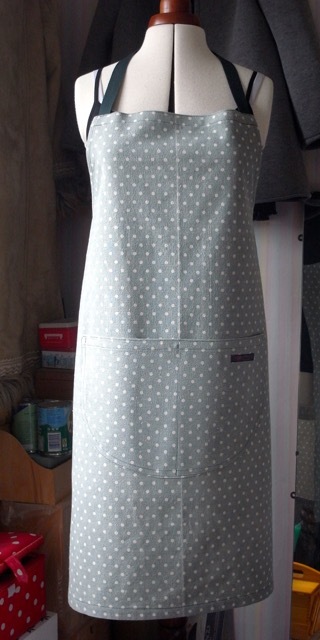 anyway it was nice to make the aprons, both finished in a day each. So a nice easy and fun make.